The Ewe people of Ghana and Togo are renowned for their polyrhymic drumming and beautiful call and response singing. Travelling through this region, one is struck by the way in which they have preserved their traditional music alongside the new cultural ideas brought by globalisation. The Dzigbordi group is a community dance drumming group that people of all agescan join. 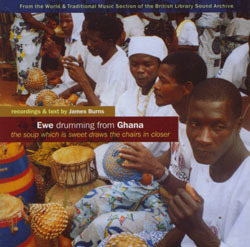 On this CD they perform several classic dances from the Ewe repertoire. For this recording they chose a secluded courtyard outside the town, resulting in a crystal clear sound that showcases the drums and the songs.